Naxos Cheese - Making Industry was established in 1990 by Emmanuel Vas. Koufopoulos in Saint Isidoros Galanadou - at the intersection of Melanes and Potamia. Emmanuel Koufopoulos created a special group of traditional cheese - making and dairy products made in Naxos, by exploiting the island's tradition and the family experience in producing cattle - breeding goods in combination with the help of modern technology. The main material used for all the products is the top - quality cow milk, collected from more than 100 cows existing at his farmhouse and the cow and goat's milk given to him by the approximately 200 selected cattle - breeders existing in the mountainous regions of Naxos. The cheese - dairy goods are produced in limited quantity. 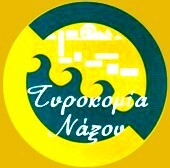 The belief in maintaining tradition, the respect to the environment, the exploitation of modern technology and the quality stamp form the ruling notions of the NAXOS CHEESE - MAKING INDUSTRY production concept. The NAXOS CHEESE - MAKING INDUSTRY products are promoted almost all around Greece and to foreign countries (Germany, the USA, etc).